Danny Sisson scored twice for City of Peterborough last weekend. 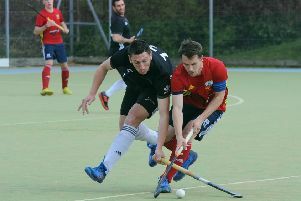 City of Peterborough Hockey Club haven’t rested on their laurels following their promotion to the National League. The boys from Bretton Gate have already strengthened their squad by enticing former players Cameron Heald and Grady Wing back to the club from National League sides Bath and Sheffield Hallam respectively. Cameron Heald is back at City of Peterborough. Further signings are also expected for a first National League campaign for five years. Sam Blunt, player-of-the-year at City in the 2016-17 season, is also back in the squad after missing last term with a serious injury. City started their pre-season campaign with a triangular friendly session at Belper last weekend when they lost to the host club 2-1 before beating Boots, Nottingham 7-2. Belper are also a National League club and took advantage of a sluggish City start to race into a 2-0 lead before Blunt struck from a short corner. Danny Sisson (2), Nathan Foad (2), Nathan Rozario, Adam Wilson and Joe Finding scored the goals against Boots from the Midlands Premier Division. City played the matches one after the other to test their fitness. They continue their pre-season programme with a trip to Loughborough on Saturday when they will tackle the home club and York. On Sunday they travel to play old East League foes Bedford in another friendly. Town start their National League season with a home game against Old Georgians on Sunday, September 30. City have a packed pre-season programme which includes a game against the Isle of Man on September 16.